We had a splendid, and busy, start to the new season on Thursday 8th September with a return visit from Viveca Koh. Viveca had enthralled us last December with her talk on Urban Exploration to Fine Art, and provided another inspiring evening with IPhone Photography to Fellowship. 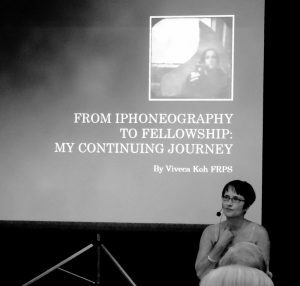 Her fascinating presentation started with an introduction to numerous iPhone apps and the rather counter-intuitive concept of the discipline of using smart phone cameras due to the demands of the fixed lens. Her resulting images, infused with the artistry, skill and often with the emotion that underlies so much of her fine art photographs, offer a deceptive simplicity combined with a fine eye for detail. It was good to see as well someone turning the selfie into an art form! You’ll also find her helpful pages on ‘how I did it’, a generous sharing of techniques and skills. Many of us might aspire to Viveca’s level of creative fine art photography with no hope of reaching her level, but her talks and website offer many tips and ideas we can learn much from. She will be back with us again! We also congratulated Kim Tattersall, Jean Brooks and Mike Hancock on winning the 1st, 2nd and 3rd prizes respectively from the Annual Exhibition Favourite Print vote. All three received book tokens. And finally, some of our Trophy Winners from last season who had not been with us at the Exhibition Preview Evening received their cups. 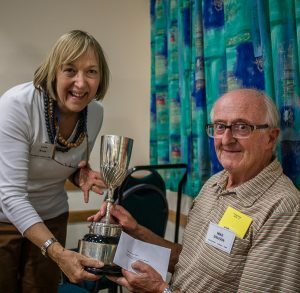 A special welcome back to joint winner of the Postma Cup for Advanced Prints, Mike Davison, returning to the Club after his ill health earlier in the year. I was very pleased to share this cup with Mike and to see him back with us.